The global phenoxyethanol preservatives market features a moderate degree of fragmentation wherein top four players held nearly 50% of the market in 2013. The remaining 50% market share is distributed among various small-sized players that mainly operate in regional markets. Prominent companies to name in the global phenoxyethanol preservatives market are BASF SE, Galaxy Surfactants Ltd., Symrise, Clariant Corporation, The Dow Chemical Company, Jiangsu Jiafeng Chemical Co. Ltd., Jinan Haohua Industry Co. Ltd., and Haihang Industry Co. Ltd. According to a market intelligence study by Transparency Market Research (TMR), the global phenoxyethanol preservatives market stood at a valuation of US$95.8 mn in 2013 and is expected to rise at a steady 5.9% CAGR over the forecast period between 2014 and 2020. At this pace, the market’s valuation is likely to be worth US$143.2 mn by the end of 2020. Of the two product types, phenoxyethanol P5 is the leading one in the phenoxyethanol preservatives market. Going ahead, the phenoxyethanol P5 segment is anticipated to rise at a significant pace due to lower free phenol content. Vis-à-vis volume, pharmaceuticals is anticipated to display rapid growth over other application segments in the phenoxyethanol preservatives market. Phenoxyethanol preservatives are widely used in pharmaceutical vaccines such as tetanus, diphtheria, polio, hepatitis B, pertussis, and Haemophilus influenza. 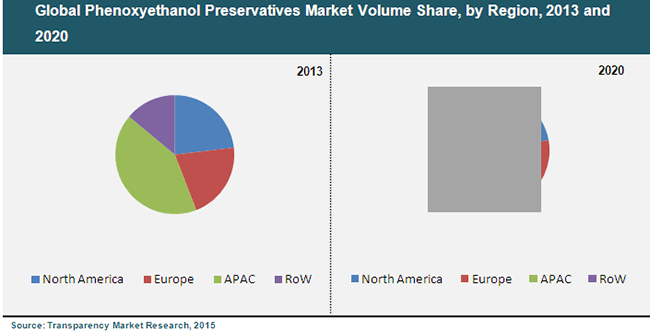 However, home and personal care holds the leading share in the phenoxyethanol preservatives market. On the basis of geography, Asia Pacific stood as the leading consumer of phenoxyethanol preservatives in 2013. Vis-à-vis volume, the region held more than 40% of the overall market in 2013. The growth of this region is spurred by extensive demand for phenoxyethanol preservatives in China. The global phenoxyethanol preservatives market is rising at a substantial pace mainly because of healthy demand for phenoxyethanol preservatives from manufacturers of cosmetic products along with rising adoption of phenoxyethanol-based blends. Phenoxyethanol preservatives find extensive use in personal care products up to a maximum concentration of 5% w/w. Phenoxyethanol preservatives find extensive application in home and personal care products due to their antibacterial properties. At present, spending on discretionary products such as color cosmetics and eye make-up is on the rise owing to rising per capita income and large number of sales channels for these products. With the growing demand for cosmetics at a rapid pace, the phenoxyethanol preservatives market is anticipated to receive a fillip through 2020, adds the report. On the flip side, shift in preference for plant-based and organic cosmetic products over synthetic ones is likely to slow the growth of phenoxyethanol preservatives market in the forthcoming years. In addition, availability of a large number of substitute products such as iodopropynyl butylcarbamate, parabens, isothiazoline, and formaldehyde & formaldehyde-donor which are cost-effective is hampering the market’s growth. Nevertheless, demand for phenoxyethanol preservatives for wipes and tissues is anticipated to provide ample opportunities to the phenoxyethanol preservatives market.